An Engineering Review Board (ERB) meeting has created an aggressive forward plan to add instrumentation to Atlantis, with the aim of gaining a further understanding into the stresses endured by a Reaction Control System (RCS) stinger attach point during Main Engine Ignition (MEI). In tandem with the engineering discussions, borescope inspections have taken place on the fleet to check for areas of fatigue and cracking. Main Engine Ignition (MEI) Acoustic and SSME (Space Shuttle Main Engine) Ignition Overpressure (IOP) Environments – and their effects on a small area at the aft of the orbiters – are at the center of the only outstanding topic for flight rationale from the recent Agency Flight Readiness Review (FRR), after post-flight analyses of Discovery’s microphone measurements indicate levels are above current Acoustics and Shock Data Book design levels. MEI acoustics are fluctuating pressure waves of sound, while IOP is related to fluctuating pressure waves due to SSME thrust ramp-up and free hydrogen ignition. The majority of locations have since been cleared as no concern, bar one – the small area related to an attach point/stinger on the aft of the orbiters at the location between the Orbital Maneuvering System (OMS) and Reaction Control System (RCS). The MEI Acoustics knowledge base has evolved since early testing prior to the first flight of the shuttle – from a 6.4 percent scale test model used in the 1970s – through to the early flights, and beyond. “Lift-off Acoustics was initially developed primarily based on the 6.4 percent scale model test but did not include SSME simulation,” noted the primary overview in Agency Flight Readiness Review (FRR) presentations, available on L2. 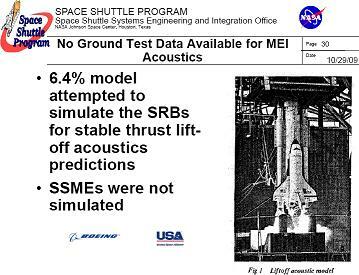 “STS-1 to -5 flight data then identified a significant higher MEI Acoustic environment than the Lift-off Acoustics. An improved environment was developed and documented in the Acoustics and Shock Data Book. “Post flight data analysis resumed after STS-26 RTF for OV-102 and OV-103. STS-95 Drag Chute Door failure during MEI transient caused an evaluation of MEI which resulted in an increase in the Drag Chute Door MEI Acoustic environment. Flight instrumentation was added for environment verification. Engineering understanding of the SSME IOP knowledge base has also evolved over the history of the program. 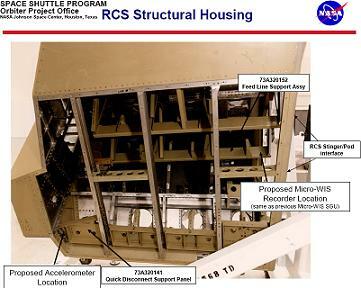 STS-95’s drag chute door incident is again mentioned for reference, along with a loss of a tile from the RCS/OMS stinger area at the aft of the orbiter (STS-122) – although that was not believed to be related to the pressure waves at the time. “Ignition of free hydrogen effects originally developed in 1980, but has changed with the addition of (sounds) suppression hardware. Pyrotechnic hydrogen burn-off system (ROFI) implemented prior to STS-1 reduced the hydrogen ignition overpressure to a negligible level and was excluded from the current Acoustics and Shock Data Book,” the presentation continued. “SRB IOP was dominant for STS-1 but suppressed by SRB Duct water deluge and water bags for STS-2 and subs. After the STS-95 Drag Chute Door failure, a design SSME IOP environment was baselined for Drag Chute Door only in Section 7.5.8 of the Loads Data Book. Up to 29 previous flights were used to refine what was a large level of conservatism for specific areas of the orbiter that could be affected by MEI Acoustics and IOP, with Ground rules and update criteria approved by Loads Panel in June 2009. This included checks on over 9000 TPS tiles – with only a handful of tiles on Discovery showing numbers that may be slightly over NASA’s 1.4 Flight Safety margins, although such findings are still based on relatively conservative numbers. Modifications to those areas in question has since been carried out via the addition of gap fillers, which have been installed on Atlantis at the pad. “MEI acoustic environments must first be converted into accelerations on TPS tiles. Accelerations are greatest at the center of structural panels where acreage tiles are present,” added an Orbiter Project presentation to the FRR. “All design acreage TPS assessed to be good for increase in IOP and MEI. Approximately 9000 tiles were assessed. Carrier panel analysis generally shows good margin for new environments. IOP has a large effect. Carrier panel tiles on base heat shield, vertical stabilizer (drag chute), and body flap are showing preliminary values of FS > 1.4. “OMS Pod/RCS have a small number of design tiles where FS < 1.4. 6 total (3 each pod) on interior side of RCS. 4 total (2 each pod) on aft end of RCS on OV-103 (Discovery). OV-104 (Atlantis) and OV-105 (Endeavour) have been changed to AETB8 as attrition mods. Checks into the effects on the orbiter subsystems also proved to be positive, while again noting the focus is on the aft of the vehicle. “Subsystems are items internal to the primary structure including tanks, mechanisms, boxes, valves and plumbing. Most subsystems are demonstrated by vibration testing. Acoustics increase would increase vibration environments. Vibration tests are not performed to failure, so actual ability to operate in increased environments is unknown. “Regions of the Orbiter with increased vibration environments have been identified to the subsystem hardware communities. Evaluation of risk to program is being performed in two phases (e.g., susceptibility to vibration including failure history, any testing conservatism, redundancy, criticality). “Phase 1 – identify subsystems that are attached so that they may be affected; evaluate any simple rationale for clearing. Phase 2 – detailed review of qual testing and related dynamics items. Components that do not have clearance rationale will be evaluated for risk. Any outstanding areas that are still to be cleared will be discussed at the L-2 Mission Management Team (MMT) meeting, which has allowed for an ERB to take place after the Agency FRR. With most areas now cleared, the entire focus of the ERB relates to the RCS/OMS stinger/attach point. 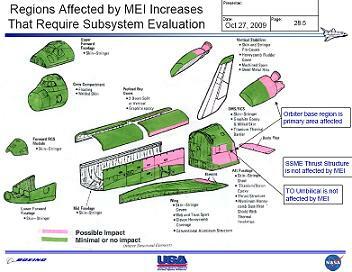 The interest in this area was increased after preliminary Orbiter assessments identified structural mission life concern for the OMS/RCS Base area (10/14/09 Joint Aero/Loads Panel) using the Design Limit criteria. Historical records were used to look at any issue with this area during the history of the program, along with a potential relation to MEI acoustics. 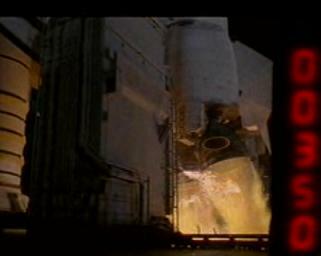 A crack found during Columbia’s overhaul in the year 2000 was highlighted. 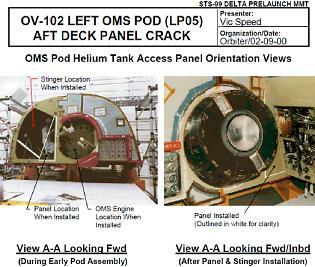 “During orbiter major modification (OMM) OMRS V30 structural inspection of the OV-102 LH OMS pod (LP05) a structural crack was detected. Finite element model confirms that pressure loading from MEI acoustics would result in local high bending stress at crack location,” noted the historical slide. After the crack on Columbia was found, the Shuttle Program called for inspections and modifications throughout the fleet. It is highly likely there’s no real structural concern for the orbiter in relation the stresses of MEI, with the buffer of Program’s Flight Safety ratios and the use of models that work from the “worst case” mathematical probability ratings. In fact, the model used for MEI and IOP related stresses is 25 years old, resulting in a new computation model being built/modified by Boeing – to be used to run analysis on the RCS/OMS stinger area by November 11 – in time for the results to be discussed at the L-2 MMT. “There is a ‘missing piece’ in the analysis chain that predicts mission life. A dynamic model is required to convert acoustic environments into detailed internal loads (RMS stresses and forces). A model was developed 25 years ago to perform this work. This model is not recoverable,” added FRR materials. “The current assessment is based on the results found in the acoustic fatigue report. Boeing is modifying an existing transient dynamic model to acoustic analysis. A fully verified model takes months to develop/complete. Objective is to provide an ‘engineering’ level model prior to STS-129 to evaluate any inherent conservatism in the original report. 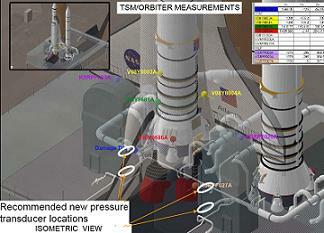 “Allows comparison of model results to flight data (principally STS-1 thru STS-5). May provide relief on internal loads and stresses. Can provide estimate of uncertainties in environment/structural response. Allows direct application of new environments. With the results of the modified Boeing model soon to be provided, a path to approving flight rational for STS-129’s launch on November 16 is laid out. “Primary approach to flight rationale is based on analysis refinement. Engineering dynamics model: Provides potential for relief on RCS attachment load by identifying conservatism in original acoustic fatigue report. Possible that scatter factor of 4 may not be met. Provides opportunity to evaluate uncertainty in acoustic environment and structural response,” noted the path to flight rationale page. Finding a crack in an orbiter’s stinger/attach points would prove to be problematic to say the least, taking an orbiter – and potentially the fleet due to commonality of hardware – out of action for around a year. This timeline is due to the location of the hardware, which can only be accessed by stripping down the orbiter to levels only seen during their major overhauls. This access issue immediately rules out modifications to the area – which was one potential mitigation option, and/or removing the hardware for Non Destructive Evaluations (NDE). “Structural Beef-up Feasibility: Design would require X, Y, Z load carrying capability and would likely result in stiffness changes and load redistributions that would need to be assessed and could cause problems in other areas,” added the presentation. “Implementation is very difficult due to limited access in the stinger area and would likely result in significant flow impact. Thankfully, engineers can still check for any signs of fatigue or cracking in the area via less intrusive borescope inspections – which have now been completed on the fleet. Around 500mb of videos and images from the inspections on all three orbiters were acquired by L2, providing a fascinating view of orbiter inners. 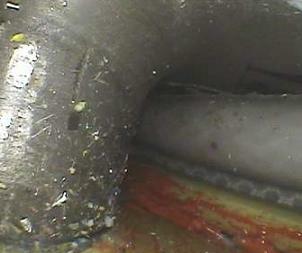 “Borescope: Provides visual inspection at part base where fracture expected to occur. May not detect needed flaw size (0.150” w X 0.068”’ d) but could detect gross anomaly. 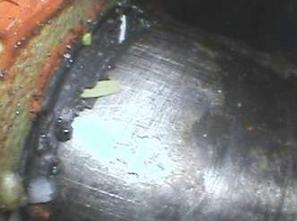 No known Probability of Detection data for 30X magnification borescope. Two potential access points for inspection were considered. Access through Stinger Door (decided on), added the FRR presentation, with Discovery’s inspection results already known. “Results: Discovery OV-103/LP01: Completed: Approx.180 degrees of circumference accessible – Minor scratches, machine marks, and possible dent seen; No cracks visible. Results are still pending for Atlantis’ inspections – which were carried out this week, though the video and images show no obvious signs of fractures. 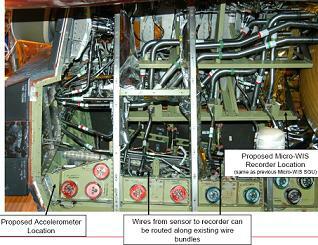 As noted in the FRR path to Flight Rationale, “additional microphone data is highly desirable to help reduce uncertainty in environment for future flights.” As a result, this became the focus of the ERB meeting on November 3, as plans were drawn up on adding instrumentation to Atlantis ahead of STS-129. “Objectives: Response to Space Shuttle Program action to develop and assess concepts for adding new instrumentation to support MEI acoustic loads data,” opened one of several presentations from the ERB meeting, and acquired by L2. Instrumentation would also be added to the Pad, with data being gained via the Mobile Launch Platform (MLP) for the time of interest (T-minus 4 to 3 seconds) as the SSMEs roar into life. “Joint effort to develop complimentary set of new instrumentation installed on both MLP and Orbiter. Timeframe of interest is around Launch Count Down T minus 3 or 4 seconds. Data gathering post Launch is not mandatory. Area of interest is in and around OMS/RCS stinger. Loads Panel interested in more acoustic data with Orbiter BHS (Base Heat Shield) acoustic as reference. 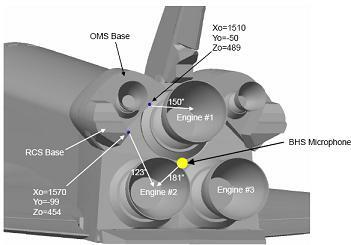 OV-104 (Atlantis) does not have aft acoustic instrumentation,” added the main ERB presentation. Although time is short until Atlantis is due to launch on STS-129, engineers already have a roadmap for sensor installation, as it has already been carried out on her sister, Discovery. “BHS Sensor Installation: Install acoustic sensor in the center of the BHS, between all 3 SSME’s. Replicate sensor installation just like OV-103 (Discovery) install. Route signal to T-0 umbilical J73 via coax. This sends signal to MLP data acquisition equipment. Same signal line as OV-103’s Vertical Tail stinger acoustic. For the Stinger location, two sets of instrumentation – accelerometers and acoustic – are desired, again using the reliable WLEIDS to acquire the data for engineers on the ground. However, unlike the WLEIDS data, engineers will wait until Atlantis has returned home before downloading the data. 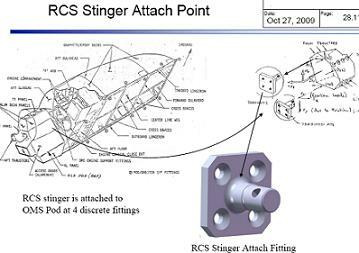 “RCS Stinger Accel Install: Install accelerometer and GFE data acquisition box inside the Left OMS/RCS Stinger. Accelerometer installed in furthest aft location inside stinger cavity – Tri-axis accel is preferred configuration,” added the presentation. “GFE WLEIDS LRU will be used for data acquisition. Accommodates up to 3 input signals – Installed/mounted in similar location to old micro-SGU location, Can be programmed via RF/laptop with startup times and acquisition data parameters. “Data will be downloaded post flight, not during flight. Safety/engineering working on appropriate documentation to update cert package. “RSC Acoustic sensor installation: Acoustic sensor installed on outside of aft stinger door – Requires penetration hole, mounting hardware, and new accommodating tile. Acoustic sensor uses third input to GFE box. Preliminary testing/analysis shows GFE WLEIDS appears to be compatible with an Orbiter acoustic sensor. “GFE WLEIDS LRU will be used for data acquisition – Accommodates up to 3 input signals. Installed/mounted in similar location to old micro-SGU location. Will have to be programmed via RF/laptop with startup times and acquisition data parameters. How much work can be achieved ahead of Atlantis’ scheduled November 16 launch date is yet to be seen. However, the ERB claims they are ready for the challenge of an aggressive schedule.